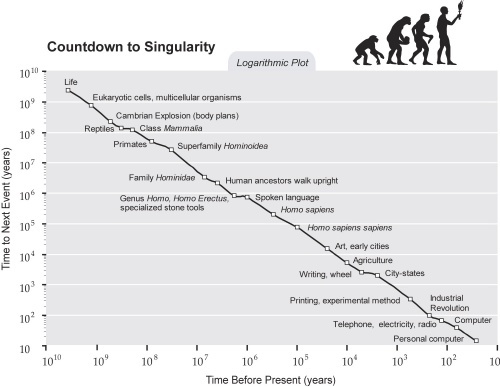 Chart Countdown to Singularity, Events expressed as Time before Present (Years) on the X axis and Time to Next Event (Years) on the Y axis, Logarithmic Plot Page 17, Linear Plot page 18. W. Altermann and J. Kazmierczak, "Archean microfossils: a reappraisal of early life on Earth," Research in Microbiology 154.9 (November 2003): 611-617; and Technical Comments, "Origin and Significance of Archean Quartzose Rocks at Akilia, Greenland," Science 298.5595 (November 1, 2002): 917, http://sciencemag.org/cgi/content/full/298/5595/917a. S.B. Hedges et al., "A molecular timescale of eukaryote evolution and the rise of complex multicellular life," BMC Evolutionary Biology 4:2 (2004), http://www.pubmedcentral.gov/articlerender.fcgi?pubmedid=15005799. J. W. Valentine, D. Jablonski and D. H. Erwin, "Fossils, molecules and embryos: new perspectives on the Cambrian explosion," Development 126.5 (1999): 851-859, http://dev.biologists.org/cgi/reprint/126/5/851.pdf. R. L. Paton, T. R. Smithson and J. A. Clack, "An amniote-like skeleton from the Early Carboniferous of Scotland," Nature 398 (08 April 8, 1999): 508 - 513. Z.X. Luo, A.W. Crompton and A.L. Sun, "A new mammaliaform from the early Jurassic and evolution of mammalian characteristics," Science 292.5521 (May 25, 2001):1535-40. S. Tavare et al., "Using the fossil record to estimate the age of the last common ancestor of extant primates," Nature 416.6882 (April 18, 2002):726-9. C.B. Stewart and T.R. Disotell, "Primate evolution—in and out of Africa," Current Biology 8 (1998):R582–R588. C.J. Cela-Conde and F.J. Ayala, "Genera of the human lineage," PNAS [Proceedings of the National Academy of Sciences of the United States] 100.13(June 24, 2003): 7684-7689, published online June 6, 2003, http://www.pnas.org/cgi/content/full/100/13/7684. M.G. Leakey et al., "New four-million-year-old hominid species from Kanapoi and Allia Bay, Kenya," Nature 376.6541 (August 17, 1995):565-71. B. 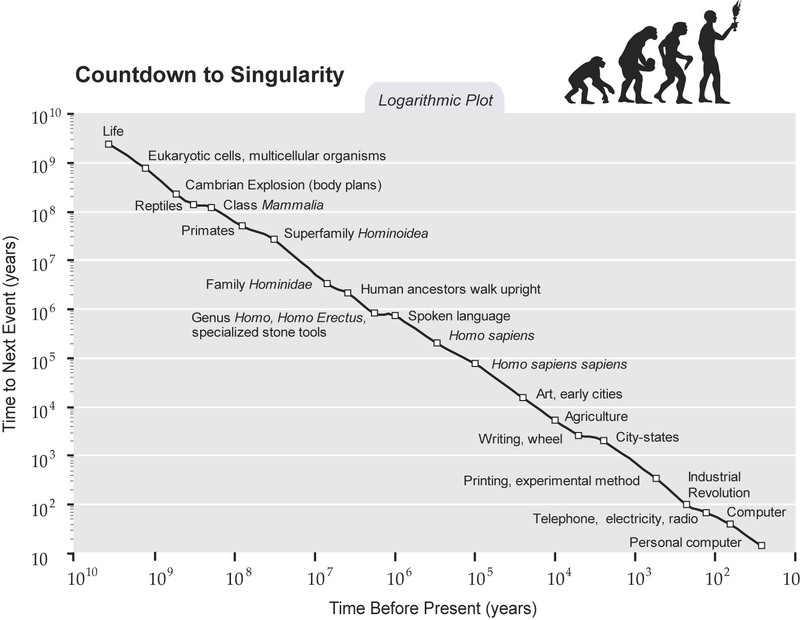 Wood and M. Collard, "The human genus," Science 284.5411 (April 2, 1999):65-71. See also Human Evolution at the Smithsonian Institution, http://www.mnh.si.edu/anthro/humanorigins/ha/a_tree.html. Y Kimura, "Examining time trends in the Oldowan technology at Beds I and II, Olduvai Gorge," Journal of Human Evolution 43.3 (September 2002):291-321. A.M. MacLarnon and G.P Hewitt, "The evolution of human speech: The role of enhanced breathing control," American Journal of Physical Anthropology 109.3:341-63. Dennis O'Neil, " Evolution of Modern Humans: Early Archaic Homo sapiens," http://anthro.palomar.edu/homo2/mod_homo_1.htm. T.D. White et al., "Pleistocene Homo sapiens from Middle Awash, Ethiopia," Nature 423 (12 June 2003): 742-747. See also The Middle Awash Research Group, "Immediate predecessor of modern humans found in Africa; 160,000 year old Ethiopian fossils are first homo sapiens," June 2003, http://www.berkeley.edu/news/media/releases/2003/06/11_bones-background.shtml. D. Nadel et al., "Stone Age hut in Israel yields world's oldest evidence of bedding," PNAS [Proceedings of the National Academy of Sciences of the United States] 101.17 (April 27, 2004): 6821-6826, published online April 16, 2004, http://intl.pnas.org/cgi/content/full/101/17/6821. O. Soffer, J. N. Adovasio, and D. C. Hyland, "The 'Venus' Figurines: Textiles, Basketry, Gender and Status in the Upper Paleolithic," Current Anthropology 41 (August/October 2000). Dennis O'Neil, " Evolution of Modern Humans: Early Modern Human Culture," http://anthro.palomar.edu/homo2/mod_homo_5.htm. Bar-Yosef, O. 2002, "The Upper Paleolithic revolution," Annual Review of Anthropology 31: 363-393. H. Pringle, "Neolithic Agriculture: The Slow Birth of Agriculture," Science Vol. 282. no. 5393 (November 18, 1998):1446. Cuneiform Digital Library Initiative http://early-cuneiform.humnet.ucla.edu. E. Tunis, Wheels: A Pictorial History (Baltimore, MD: Johns Hopkins University Press, 2002). McGraw-Hill Encyclopedia of Science & Technology, 9th Edition (New York: McGraw-Hill Professional, 2002). Computer History Museum, Timeline, http://www.computerhistory.org/timeline/timeline.php.